In with the old: out with the new. Those wishing to withdraw from the aching pleasures of traditional New Year’s Eve celebrations might like to tune in to Resonance 104.4 FM between 1.00 and 2.30 am when they will get a chance to hear ‘Mondo Exotica’: a programe based on my conversation with Francesco Adinolfi at Barbican’s ‘Mambo Italiano’ event in October of this year. The main topic of our discussion was Francesco’s book Mondo Exotica: Music for the Cocktail Generation, a study of Western culture’s fascination with ‘exotica’ recently published in translation by Duke University Press. It’s sad to reflect that so many of the people whose work we discussed that night are no longer with us: just this year Yma Sumac, Bettie Page and Eartha Kitt joined Martin Denny, Les Baxter, Arthur Lyman and Esquivel at that great Shell Bar in the Sky. Resonance FM’s ‘Mondo Exotica’ broadcast will also feature extracts from the soundtrack of swinging comic-book crime caper Diabolik (d. Mario Bava, 1968): a work which never seems to bow under the cumulative effect of the years. 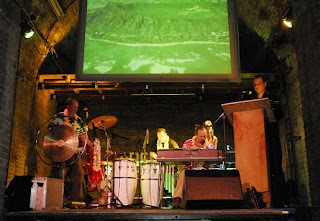 The image above shows KH, Graham Massey and members of Tool Shed performing ‘Ego in Exotica Sum: In Memoriam Martin Denny 1911-2005’ at Mondo Mancunia last month. A studio recording of this funeral oration can be found in the online collection of at Soundmuseum FM. You can search out the track by typing either Ken Hollings or Graham Massey into the museum's search engine.